Summary : OptionRally is the best option for many traders as it displays considerable concern for the safety of its trader’s funds. OptionRally trading platform was launched in 2011 by OptionRally Financial Services Ltd, a regulated broker company which manages the trading platform to date. The platform is governed and regulated by CySEC in order to ensure absolute safety of its traders. For this reason, it is amongst the safest trading platforms that you can trade in today. It is recognized for maintaining up to date privacy and security standards for all its traders, and this ensures that information and funds are in safe hands. OptionRally is an intuitive trading platform, and by keeping track of a trader’s movements, the right educational services are made available. It is powered using a web-based SpotOption platform which is a testament of its efficiency. There is an option of mobile trading as well, for those traders that prefer to trade while on the move. 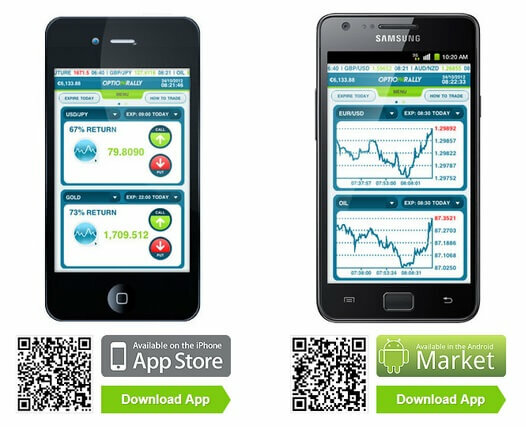 Both Android and iOS applications are available. 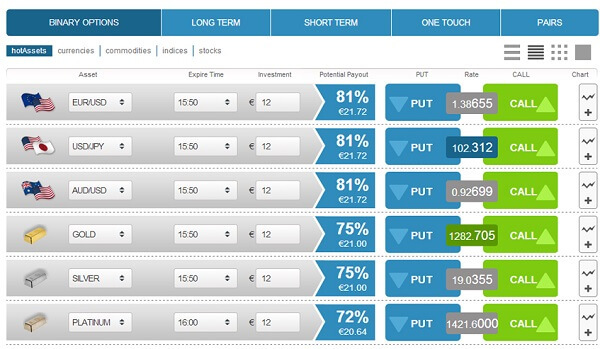 OptionRally has an easy to use and simple trading platform. New users will have no problem navigating through the site and the experienced traders are able to access advanced trading tools and information that places them at the right position to win in the trade. This site also has an extensive list of educational resources to coincide with the long list of assets that are available. With more than 100 assets to choose from, it is clear that this site features something for everyone. This site also has the benefit of making concessions for its traders from all over the world. It is one of the few sites that currently accepts traders from the US. It is also possible to create a specialized account for Arabic traders, that is able to properly comply with specific religious traditions of Islam. OptionRally has trading accounts that can be used by different traders on different trading levels. These accounts range between the mini trading account to the VIP club account. Beginners can make deposits of as low as 250 and a maximum of 999 on the mini trading account to enjoy a welcome bonus of up to 15% among other benefits. The VIP account on the other hand attracts a deposit of $10,000 or more and through this account, there are even more benefits are in store for you, from a welcome bonus of 25% to a free iPad/iPhone4/Samsung Galaxy S II/Galaxy Tab if you are able to make a deposit of $15,000. Payouts of up to 80% can be expected from OptionRally on the standard accounts. If you go for a Binary Options Trade that carries higher risk than usual, for instance the OneTouch option, you might stand to benefit from a payout of up to 400%. The bonuses are also excellent and fall into two major categories, namely the standard and the leverage bonuses. All traders are entitled to a range of bonuses as they trade. This site takes a highly professional approach when it comes to its customer support for all traders. There are various options at your disposal should you need to contact a CFD / Forexs expert for help. You can choose the phone, live chat and email. In order to actually secure a proper interaction, it is necessary to have an Executive Account. This will enable you one on one access with a trade analyst, who can guide you through the steps that you need to take, even if you may have never traded anything before. The customer support staff are geared towards ensuring immediate results to all problems. It is available on four languages, which include English, Turkish, Arabic and Vietnamese. To take care of all global customers, there are eight countries where you can reach a support staff member on the phone. OptionRally is the best option for many traders as it displays considerable concern for the safety of its trader’s funds. It is a well-regulated broker and fully registered. It offers some of the best education and support services to ensure that traders are well assisted round the clock. Anyone can fit in with OptionRally since it offers different accounts for different traders at varying trading levels. It is one of a kind trading platform that is worth your consideration.